Caspar Buberl, Sculptor of the 111th New York Infantry Bronze Statue. See the sculptor of the 9th New York Cavalry tab at right for more information on Buberl. A rare albumen image, taken by famed Gettysburg photographer William Tipton, of the 111th New York Infantry Monument just after completion in 1891. In the foreground can be seen a portion of the famous stone wall. Also, in the background can be seen the Codori farm. The sculptor signed his work when he completed the clay model in 1889. Most of Buberl's works at Gettysburg are unsigned. The bronze statue of the 111th New York Infantry represents a northern soldier on the skirmish line. In the American Civil War infantry tactics were used to direct the movement of the armies. Infantry soldiers were taught how and where to move when given specific commands. Hours of drilling were required to educate new recruits in these tactics. Above you will see a page from an original volume of Casey's Infantry Tactics Volume 1, on the deployment of a platoon (half of a company) to the skirmish line. The men would deploy into groups of four men (if the skirmish line would be attacked by cavalry these four men would regroup and form a four man square) and then these men would deploy in a single line spread out approx. 5 paces between each. This deployment would be several hundred yards in advance of the main infantry line of battle. The intent of a skirmish line as described in Casey's Infantry Tactics was "When skirmishers are thrown forward out to clear the way for, and to protect the advance of, the main corps, and their movements should also be regulated by the corps, as to keep it constantly covered." In other words the skirmish line protected the main line from any surprises from an advancing enemy. The 111th N.Y. Infantry along with many other regiments would be deployed as skirmishers in front of the 2nd Corps line on Cemetery Ridge during the Battle of Gettysburg. Caspar Buberl was the sculptor of the bronze statue of the 4th New York Light Artillery (Smith's Battery) monument located above Devil's Den. This wonderfully detailed sculpture is of an artilleryman, rammer in hand, striking a confident pose. The bronze portion of this monument was destroyed by vandals several years ago. 9th New York Cavalry Monument - dedicated July 1, 1888. 52nd New York Infantry Monument - dedicated July 3, 1893. Blue Balloon: 111th N.Y. Inf. Monument approx 20 feet east of the stone wall. Green Balloon: 12th N.J. Inf. Monument along the stone wall. This war of words would continue for nearly one year until the dedication of the 111th N.Y. monument in June, 1891. 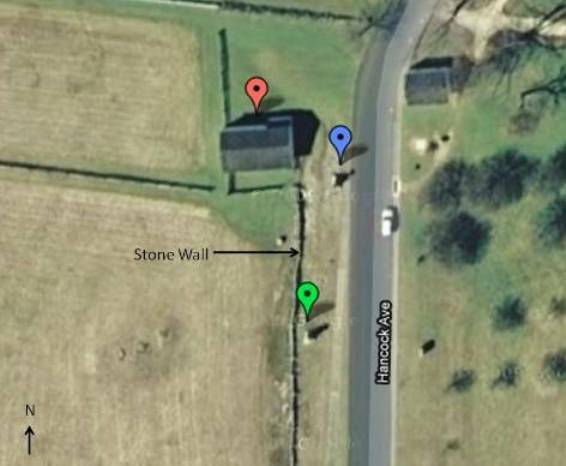 As you review the map above, you can see the monument of the 111th N. Y. Infantry is indeed behind the line of the 12th N.J. and not along the stone wall. By most accounts, the left of the 111th N.Y. was behind the right of the 12th N.J. The 111th N.Y. occupied the area around the Bryan Barn and by most eye witness accounts the monument now occupies the correct position. At the dedication of the monument, Colonel Mac Dougall during his oration would remind the members that the monument was erected "on the spot where your colors stood" and where "four color bearers grandly gave up their lives in their defence."